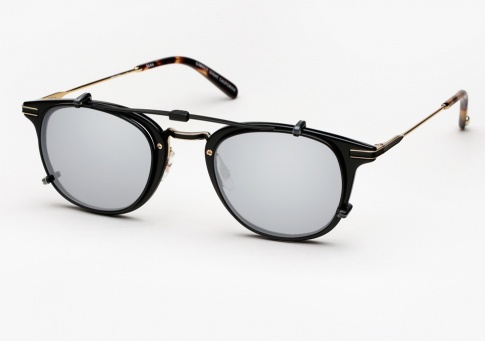 Garrett Leight Kinney Combo - Black + Clip (Eye) Need Help? Garrett Leight's best selling Kinney shape redesigned with a metal bridge, adjustable nose pads, and metal temple inlays in colors inspired by the Southwest. It is is offered here in black with dark tortoise temple tips, and gold metal. Wear it as a sunglass or an eyeglass. Originality and versatility is taken a step further with the addition of Garrett Leight's signature metal foldable sunglass clip-on lenses, designed specifically for the Kinney Combo. The matte black clip-on features a thin, arching top bar and CR-39 layered "soft black" mirror lenses. Comes with foldable metal sunglass clip-on lenses.